In this episode of The Secret World of Gardens we explore how you never really know what you're looking at in the garden unless you've got the whole story. Walking sticks that look just like twigs devour the foliage in plain sight but no one seems to notice, spiders that are perfect chameleons blend in to kill, and caterpillars that mimic poop are the stars of this show. And it's not only your eyes that you can't trust. Watch tthis episode to see how some creatures can also fool your ears and your nose. 1. Life In A Vegetable Garden - Many mouths to feed, and clever ways to avoid becoming a meal. 2. Nightlife - What comes out at night in the garden. 3. Honeybees - The role of honeybees in a common garden. 4. Appleachia - The amazing array of life an apple tree can lure into a garden. 5. Fungi - What you see is only the tip of the iceberg. 6. Sap Sucking Hoppers - The astronauts of the garden. 8. Vines - The good, the bad and the ugly side of vines. 9. Whether The Weather - How plants survive the stress of changes in the weather. 11. Squirrels - What are these chipmunks and squirrels doing in the garden? 12. The Old Oak Tree - The diverse world of oaks and their residents. 13. Life In A Lawn - Paradise is a well-tended lawn. "As an educator, I am always looking for fun and educational videos to help reinforce what we are teaching the children. Garden Mimics is a fun and visually stimulating piece. The information provided is very appropriate for upper elementary and middle school students." "Through dramatic macro-photography, viewers enter the sci-fi beauty of the garden and gain a new perspective on the interactive roles played by everything from the lowly earwig to the majestic rose." "This outstanding series is especially recommended for school and community libraries as being of special interest and value for children and adults with an interest in gardening and its flora/fauna ecosystems through all four seasons of the year." 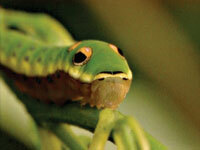 "Garden Mimics is a wonderful look at adaptations of different garden inhabitants. The swallowtail caterpillar with the 'snake-eye' coloration was nice to see in the video - I've even used those caterpillars during educational programs. It was a nice way to show the interactions of the different insects and how they use their adaptations to their advantage."